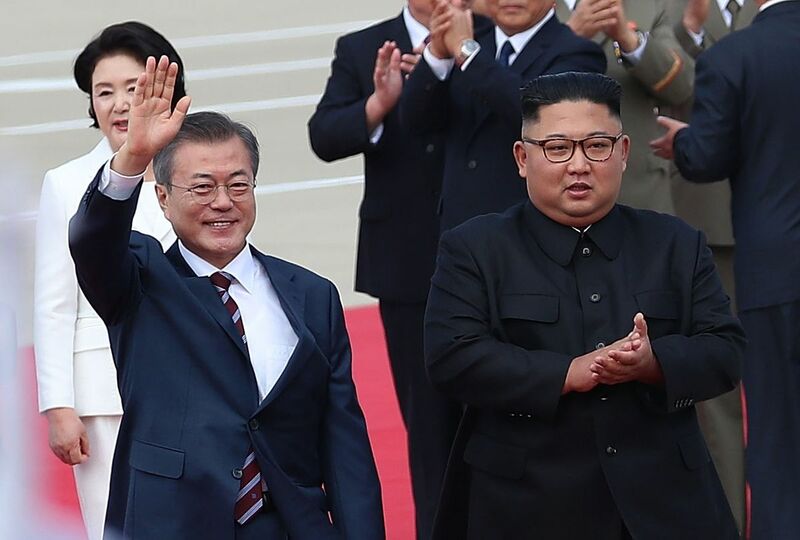 North Korean leader Kim Jong Un and South Korean President Moon Jae-in are in the middle of a dramatic three-day summit that has featured warm hugs, elaborate musical performances, and throngs of Pyongyang’s residents lining the streets to catch a glimpse of the historic moment. Late Tuesday night, the pageantry turned into actual business as both leaders vowed to improve their fraught relationship and announced an agreement in which Kim offered the concrete steps toward dismantling his country’s nuclear program. The problem is their agreement is extremely vague — and may actually prove bad news for the United States. Here’s some of what they agreed to: Kim said that he’d travel to Seoul by the end of the year — a first for any North Korean leader — and that both sides will work to reduce tensions at their heavily militarized border. Kim and Moon even agreed to jointly bid to host the Olympics in 2032. But on the issue that matters most to the United States — the dismantling of North Korea’s nuclear program — no one can claim much progress. Kim said he’d allow international inspectors into the country to watch as he destroys a missile engine testing site and a major nuclear facility, but experts say Pyongyang doesn’t actually need those specific sites anymore, which makes that a much less significant concession than it sounds. Kim added the caveat that he’d follow through on his concessions if the US makes unspecified concessions of its own. That’s a pretty important caveat: The North Korean leader has basically offered to give up very little while expecting America to concede more before anything happens. President Donald Trump, however, claimed victory on Twitter, noting all the agreements between the two Koreas and Kim’s vow to take down some of his nuclear installations. That underscores how Kim’s high-wire strategy to keep Trump happy — while still quietly improving North Korea’s nuclear arsenal in the background — may just pay off for the North Korean dictator. North Korean leader Kim Jong Un and South Korean President Moon Jae-in made a lot of promises to each other on September September 18, 2018. The two Korean leaders signed what is formally titled the “Pyongyang Joint Declaration of September 2018.” It contains a lot of plans to improve inter-Korean ties over the coming years. The agreements break down into roughly three categories: military, economic, and societal. Moon and Kim agreed to withdraw 11 guard posts from the Demilitarized Zone (DMZ) — the official (and somewhat confusing) name of the heavily fortified border between the two countries — by the end of the year. Though the Korean War functionally ended in 1953, it ended with an armistice, not a peace treaty. That means both sides technically remain at war, which is why troops remain on both sides of the border. Removing some of those guard posts, then, means that both sides have downgraded their war-like posture toward each other. It by no means ends the standoff, but it does reduce it somewhat. The two sides also agreed to create a joint military committee to help lower tensions at the border and maintain communications in case of a flare-up; disarm a jointly controlled border village, in part by removing land mines; and set up a joint search party to look for the remains of troops who fought and died during the war. Moon and Kim agreed to create east coast and west coast connections between the two Koreas via rail and road, which will help businesses on both sides ship their products across the border and thus hopefully improve commercial ties between the two countries. They also promised to work to reopen — and keep open — a joint industrial site and tourism center that were both previously shut down over increasing tensions. That will stimulate their economies and allow Koreans from the North and South to mingle with one another. The tourist site, known as the Mount Kumgang Tourism Project, could also serve as a place for families separated by the war to reunite — an important issue because many haven’t seen their family members in decades. Kim also said he would visit Seoul by the end of the year, which would be a first for any North Korean leader. While Kim stepped into South Korean territory in April, visiting his southern neighbor’s capital city will prove one of the most dramatic moments in the long, tense history of the divided peninsula. Should the bonhomie continue over the coming years, both sides also said they would like to jointly bid to host the 2032 Summer Olympics. That would be incredibly symbolic, especially since the serious peace talks between the two Koreas began after North Korea sent a delegation — including athletes, musicians, cheerleaders, and high-level politicians — to the 2018 Winter Olympics in South Korea. It’s unclear, of course, how many of these announcements will come to fruition. North Korea in particular has a history of promising positive steps toward good relations with South Korea only to back out of them later. What is clear, though, is that what Kim promised Moon is much more significant — and much more likely to happen — than what the North Korean leader promised Trump. North Korean leader Kim Jong Un and President Donald Trump during their Singapore summit on June 12, 2018. One of the reasons Moon traveled to Pyongyang was to try to break the current impasse in the nuclear talks between North Korea and the United States. Kim wants Trump to sign a peace declaration — an agreement that says the Korean War is over and that America will never attack North Korea — before he makes any nuclear concessions. Trump promised Kim he’d do that soon after their June summit in Singapore. The Trump administration, however, insists that Kim must first cut his nuclear arsenal by 60 to 70 percent — or offer some other major concession — before the US will sign a peace declaration. So although Kim’s offer Tuesday night to tear down a missile engine testing site and nuclear facility with international inspectors present may seem like a big deal at first glance, the reality is that it is still contingent on the US offering concessions — such as signing the peace declaration. Which means the two sides are still at an impasse, with both sides refusing to move until the other side moves first. Still, Trump tweeted his pleasure with Kim’s offer on Wednesday morning. That’s good news for Kim: He received Trump’s praise for saying he’ll do what the president wants, even though it seems like he has little intention of actually doing anything unless the US makes a concession as well. Meanwhile, Kim has grown closer to Moon and has shown that the two Koreas can improve their relationship without America’s help. That could potentially weaken US-South Korea ties in the future. And if that’s the case, Kim will have kept his nuclear weapons and damaged an alliance that he fears plots his overthrow. 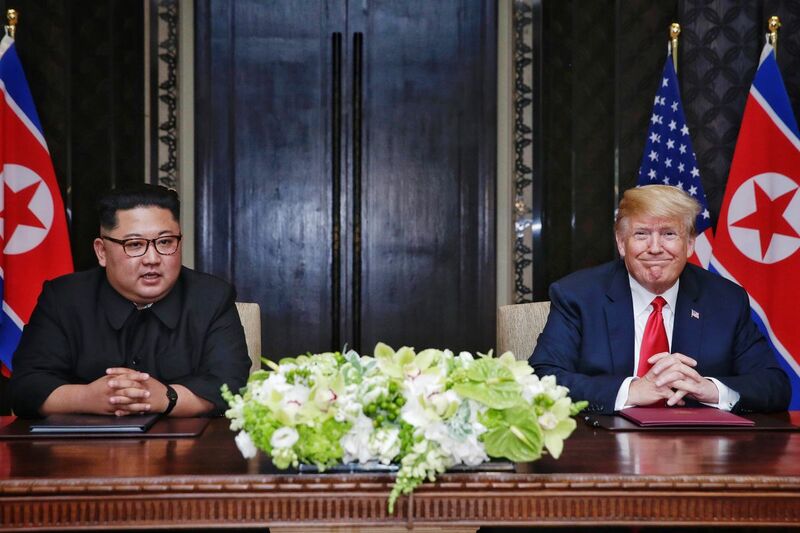 “That’s Kim’s endgame, and he’s scored another major leap forward with this sham summit,” says Sung-Yoon Lee, a Koreas expert at the Fletcher School at Tufts University.